Saturday morning the winds look to be exceptional for the start. 15-20 knots from the southerly quadrant, sometimes east and sometimes west, should make sailing in the harbor and the exiting of the port, exciting to watch. 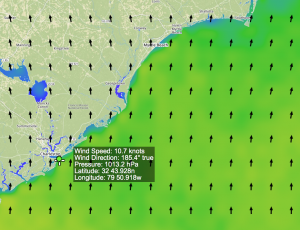 Once the boats exit the Charleston Harbor, the teams have to decide whether the speed of their sailing warrants working east, offshore to the Gulf Stream or, if they are fast enough, taking the shorter, direct route to Cape Hatteras. Here’s where knowing math and your boat play a big part in how you set up for the second part of the race; Cape Hatteras to the New Jersey Finish. The winds are forecast to turn to mixed conditions as the Class40’s round Cape Hatteras and leave it behind in their wake. If the sail to Cape Hatteras is quick and stable, the boats may arrive before the winds turn fluky and make good distance towards New Jersey. If not, the sail from Hatteras to New Jersey will turn into a real game of strategy dictated by weather predictions and real-time weather conditions. Stay tuned, the weather is fairly predictable within 48 hours, but Cape Hatteras is beyond that threshold at this time. Oh, there’s one other element to watch for these sailors. In the unsettled weather, there are bands of rain and thundershowers often embedded with squalls of increased wind, rain, and lots of work for the sailors. For the boats that head east to the Gulf Stream hoping the additional 3-knot current will get them to Hatteras sooner, thunderstorms may make their nights exciting as the warm water of the Gulf Stream stirs up the already unsettled weather. This can be a benefit if the gusts are handled well, giving the experienced sailors extra burst of speed through the storms. Stay tuned and see below how to follow the race!